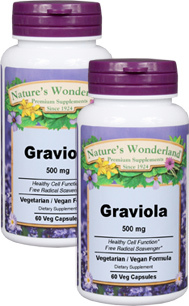 Graviola - 500 mg, 60 Veg Capsules each (Nature's Wonderland) - Penn Herb Co. Ltd. The Graviola tree is found in the tropical areas of the world. While the tasty, spiky fruit known as soursop is enjoyed all over the Caribbean and parts of South America, the leaves are a traditional immune support remedy. More recent scientific studies suggest that Acetogenins, the active constituents of Graviola, can support healthy cell growth and function. Other active compounds found in Graviola leaves have free radical scavenging properties. Supports healthy cell growth and function; free radical scavenger. Take 2 capsules 3-4 times daily as needed. NOT RECOMMENDED FOR PREGNANT/NURSING WOMEN. CONSULT PHYSICIAN IF TAKING MEDICATION OR HAVE A MEDICAL CONDITION. SEE PDF LABEL FOR ADDITIONAL CAUTIONS.